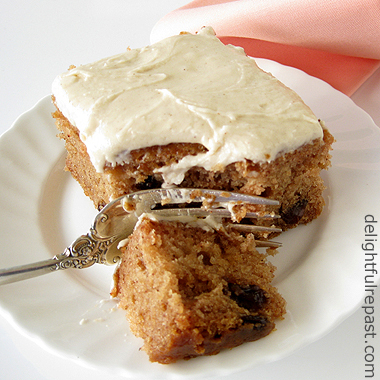 This applesauce spice cake is free of four common food allergens: gluten, eggs, dairy and nuts. So it's perfect for a picnic or potluck where there are bound to be people allergic to at least one, if not all four, of those things. I call any cake served right out of the pan a "picnic cake"--easy to transport, easy to serve. It is the gluten-free, larger "picnic version" of my Recession Cake Not Quite Depression Cake Vegan Applesauce Spice Cake. Now that school has started, think of it as a wholesome after-school snack or easy-to-pack lunchbox treat. The frosting on this cake is made with butter. If you're making it for someone allergic to dairy, just make a vegan frosting or do as I often do and simply leave the cake unfrosted. It's moist and tasty enough on its own. But if you are not averse to a little butter, I think this Browned Butter Frosting is the perfect topping for any spice cake. 1 Preheat oven to 350 degrees. Lightly oil, or spray with cooking spray, a 13x9x2-inch glass baking dish. 2 In large mixing bowl, whisk together flours, sugar, soda, xanthan gum, salt and spices. Stir in the raisins, separating the clumps. Add the applesauce, oil, and vanilla. Blend well. No electric mixer needed. 3 Pour into prepared pan. Bake at 350 degrees for about 40 to 45 minutes or until it tests done. 4 Cool in pan on wire rack for about 2 hours. If you like, frost the top with Browned Butter Frosting once cake is completely cool. 1 In 2-quart saucepan, melt butter and salt over medium heat. Continue cooking, stirring or swirling frequently, until butter gets foamy and bubbly and just starts to turn light tan, about 3 minutes. You cannot take your eyes off it! Remove from heat. Cool completely. 2 Add powdered sugar and vanilla to the browned butter in the pan. With electric hand mixer, beat at medium then high speed, gradually adding milk, until frosting is smooth and spreadable. 3 Spread on top of the cake in 13x9x2-inch pan. If you look closely at the photo, you can just see the tiny brown specks of browned milk solids in the unstrained browned butter. What PERfect timing, Jean!! I'm canning [what seems like] tons of applesauce. I never add sugar or anything else when I can, so it's perfect for this recipe. I may make this over the weekend. It looks absolutely delicious! Eventually, Sully, I will get you into the kitchen! This looks delicious, and perfect for guests with allergies; it's never fun having to skip dessert. Thanks, Ashley! That's true, and I especially like it if I can serve everyone the same dessert. Perfect for gluten-free diet! Love sorghum flour. Angie, thanks!I skipped over sorghum flour for years--just didn't sound good--but now it's one of my favorite GF flours. A lady in our neighborhood always brought a spice cake to any potluck she was invited to. As a kid I turned my nose up at it.. I mean, come on, it wasn't chocolate. lol Good thing for me, I got over that as I got older. Spice cakes are wonderful.. and I love the frosting you use here! YUM! wow that looks wonderful for fall. I just love anything with warm spices! Thanks! Isn't it funny how there are foods that we can make year round but that have more appeal in fall or winter? Jean, this cake looks wonderful! Going to try it-I've got 2 grandchildren who have a gluten intolerance. Thanks for sharing it! Pamela, thank you! I hope you and your grandchildren will like it as much as we do! Cinnamon Babka - Not A Lesser Babka!